Nordic Air offers custom service to move people and gear in Southeast Alaska. Passengers also experience the best way to see Alaska - by air - along with receiving the pilot's local insight. While the options for a flight are nearly unlimited, the most frequent types of flight service requested of Nordic Air fall into three categories: Glacier tours, Commercial fishing support and Transportation to and from remote locations throughout the Tongass National Forest. At the sight of the glacier, you'll know the blue of the glacier ice is real. Open the window of the Cessna aircraft and you'll know how cold it is. Look down and you'll see seals resting on the floating ice. From the high approach, understanding the scale of rock and ice is challenging until you start to circle down for a closer look. Then, you begin to understand how massive it really is. 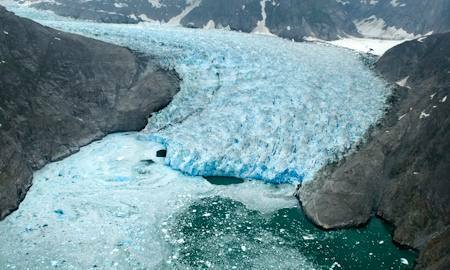 One mile wide, LeConte Glacier is a thirty minute flight from Petersburg. 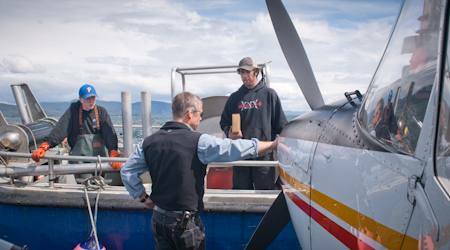 On open water, Doug (standing on the plane's float) delivers a hydrolic part. Since 1989, Nordic Air has provided aviation services to Icicle Seafoods, Inc and its commercial fisherman. Services range from fish spotting to fleet support. Southeast Alaska's Tongass National Forest is about 26,250 square miles of islands and mainland. Covered by forests, lakes, meadows, glaciers and rock, it is most of SE Alaska. 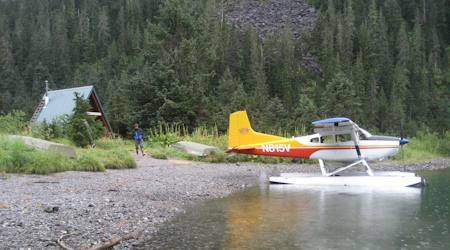 Its great hiking, hunting and fishing locations are mostly remote and are best served by float-plane. A few of these locations have Forest Service cabins that can be reserved. Arrange with Nordic Air to get you and your gear to one of these locations, and then pick you up when your stay is complete. After a few nights at a cabin, Nordic Air provides the flight back to town.